Naval Surface Warfare Center. Insights on Leveraging Innovation and partnerships, Leading the Global Partnership Initiative from Ambassador Elizabeth Frawley Bagley, and Forging a New Paradigm of Engagement Through Innovation from Alec Ross. Our Forum includes articles on analytics and risk. This issue includes conversations with Dr. Bobby Braun, Chief Technologist, National Aeronautics and Space Administration (NASA), Lt. General Bruce Green, M.D., Surgeon General, U.S. Air Force, Sam Pulcrano, Vice President of Sustainability, U.S. Postal Service, Cas Holloway, Commissioner, New York City Department of Environmental Protection. Profiles in Leadership articles, Dave Bowen: Driving IT Coordination and Innovation at the FAA, Vice Admiral Jack Dorsett: Strengthening the U.S. Navy’s Information Dominance for the 21st Century, Dr. David McClure: Promoting Transparency, Participation, and Innovation in Government, Richard Spires: Leveraging IT to Enhance DHS Mission Effectiveness. Insights from Clarence Carter, Director, District of Columbia Department of Human Services. 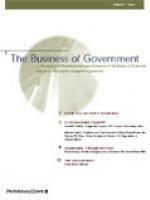 Forum articles on performance and an effective government, cutting costs and improving performance, and Lessons Learned Implementing Federal Financial Systems Projects. 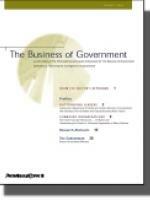 Viewpoints on regulatory partnerships, innovation, and cloud. This issue includes conversations with S. Ward Casscells, M.D. : Assistant Secretary of Defense for Health Affairs U.S. Department of Defense, James Lockhart: Director of the Federal Housing Finance Agency, Kamal Bherwani: Chief Information Officer for New York City’s Health and Human Services and Executive Director of HHS-Connect, Tom Allen: Improving Federal Financial Reporting, Michael J. Astrue: Building a Social Security Administration for the 21st Century, Tom Day: Leveraging Innovation to Transform the United States Postal Service, Kay T. Ely: Providing Human Capital Solutions to Federal Agencies, Vice Admiral Robert B. Murrett: Advancing Geospatial Intelligence across the Intelligence Community, and Vice Admiral Adam M. Robinson, Jr., M.D. : Leading Navy Medicine into the 21st Century. Our forum includes articles on healthcare and innovation. 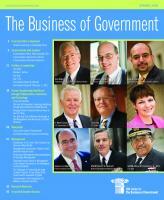 Our viewpoint includes articles on contracting. This issue includes conversations with J. Christopher Mihm: Managing Director, Strategic Issues U.S. Government Accountability Office, Paul R. Brubaker: Administrator, Research and Innovative Technology Administration, U.S. Department of Transportation, Dr. Richard Beck: Measuring Performance to Inform Management Decisions at Interior, Robert J. Carey: Delivering Secure, Integrated Information in Real Time to Sailors and Marines, Rex W. Cowdry, M.D. : Helping Marylanders Make More Informed Health Care Decisions, Robert Doyle, M.D. : Applying an Ecosystems Approach to Monitoring the Nation’s Natural Resources, Mitchell L. Glassman: Keeping a Watchful Eye on the Stability of the Nation’s Banks, Robert Howard: Transforming IT Processes to Better Serve Veterans, Jonathan Q. Pettus: Enabling IT Collaboration Across the National Aeronautics and Space Administration, Lieutenant General James G. Roudebush, M.D. : Saving Lives and Improving the Treatment of Traumatic Injuries, and J. D. Sicilia: Promoting Quality Improvement Methods for a More Efficient Military. Our forum and viewpoint sections both include articles on the presidential transition. 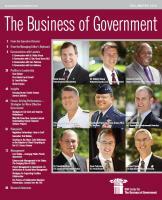 This issue includes conversations with Anthony Fauci, M.D: Director, National Institute of Allergy and Infectious Diseases, Admiral Thad Allen: Commandant, United States Coast Guard, Dr. Robert D. Childs: Senior Director, Information Resources Management College, National Defense University, Carolyn M. Clancy, M.D. : Leveraging research into healthcare quality, costs, outcomes, and patient safety, Rear Admiral Christine S. Hunter, M.D. : Providing care to military personnel and their families, Jenni Main: Managing the Troubled Asset Relief Program, John T. Morton: Enforcing the nation’s customs and immigration laws, Vice Admiral Alan Thompson: Managing a responsive supply chain in support of U.S. military operations, and Inés R. Triay, Ph.D.: Managing the world’s largest nuclear waste cleanup. Our forum includes articles on transparency. 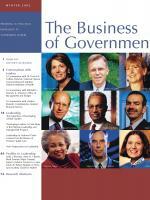 Our viewpoints include articles on the presidential transition, NASA, and collaboration. This issue celebrates the Center's 10th Anniversary and conversations with James Cartwright: Vice Chairman of the Joint Chiefs of Staff, U.S. Marines, Sir Nigel Hamilton: Head of the Northern Ireland Civil Service (NICS), Robert Hess: Commissioner, New York City Department of Homeless Services, Roy A. Bernardi: Reaching Out to Homeowners in Need, Elaine C. Duke: Supporting a Dynamic Mission, Tyler D. Duvall: Developing Innovative Approaches to Traffic Congestion, Ambassador Patrick F. Kennedy: Managing Transformational Diplomacy, Robert M. Kolodner, M.D. : Leading the National Health Information Technology Agenda, Dr. Raymond L. Orbach: Advancing Scientific Discovery Through Transformational Science, Marcus C. Peacock: Using Efficiency Measures to Track Progress Toward a Cleaner Environment, Linda Jacobs Washington: Supporting Mission-Critical Operations, and James A. Williams: Creating a Single Interface into the Federal Marketplace. 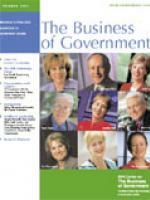 Our viewpoints include Federal Government Reform:Lessons from Clinton’s ‘Reinventing Government’ and Bush’s ‘Management Agenda’ Initiatives, Words from the Wise: What Senior Public Managers are Saying about Acquisition, and Driving Improvements in Government Service Delivery, and Using Lean Six Sigma: Defense Leads the Way. Conversations with Leaders, which include: Clay Johnson III and the Honorable Timothy M. Kaine. Profiles in Leadership, which include: Jayson P. Ahern, Maj. Gen. Elder Granger, Nina Rose Hatfield, Michael P. Jackson, Lt. Gen. Michael W. Peterson, Dr. Jeff T. H. Pon, Dr. Ronald P. Sanders, Jonathan "Jock" Scharfen, and David M. Wennergren. Our Forum, "Five Management Challenges in an Internet-Enabled World." 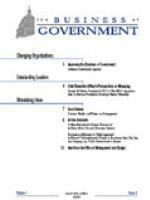 Management articles on performance management, payband systems, and human resources shared services. 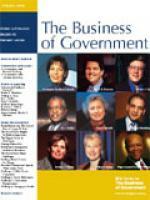 Individual articles include Conversations with Leaders: Rob Portman, Clay Johnson III, Linda Combs, Paul Denett, Karen Evans, Robert Shea, and Solly Thomas; Profiles in Leadership, which include Admiral Thad W. Allen, Douglas J. Bourgeois, Josefina G. Carbonell, Karen S. Evans, Dr. George M. Gray, Vice Admiral John C. Harvey, Jr., Dr. Stephen L. Jones, R. David Paulison, and R. Allen Pittman; Forum: Collaborative Governance; management articles, "A Model for Increasing Innovation Adoption: Lessons Learned from the IRS e-file Program" and "Lessons from Katrina for Improving the Delivery of Emergency Benefits;" and research report abstracts. This issue includes conversations with David Walker and Preston Jay Waite; leadership profiles of Russell Chew, Judy Davis, John Dyer, Lisa Fiely, W. Todd Grams, Donald Lindberg, M.D., Phyllis Scheinberg, Linda Springer, and Admiral Robert Willard; a forum on "Successful Performance Management;" the management article, "Sharing an Understanding of Shared Services;"and research report abstracts. This issue includes conversations with Kenneth Feinberg and Admiral James Loy; leadership profiles of Ambassador Prudence Bushnell, Patrick R. Donahoe, William E. Gray, Ira L. Hobbs, Fran P. Mainella, Michael Montelongo, Kimberly T. Nelson, Rebecca Spitzgo, and Major General Charles E. Williams; a forum on "The Second Term;" and research report abstracts. 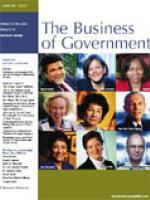 This issue includes conversations with Mayor Martin O'Malley, Clay Johnson III, and the Nation's First Homeland Security Team; leadership profiles of W. Ralph Basham, Marion Blakey, Johnnie Burton, Rose O.Parkes, Roberto Salazar, Gwendolyn Sykes, Ambassador Randall L. Tobias, Andrew von Eschenbach, M.D., and Elias A. Zerhouni, M.D. 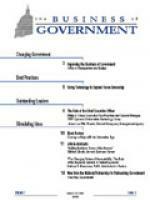 ; a forum on Transforming Government; a Management piece on Sean O'Keefe at NASA, and research report abstracts. This issue includes conversations with Clay Johnson III and John A. Koskinen; leadership profiles of Hector V. Baretto, Carolyn Clancy, M.D., Norman Enger, Janet Hale, Eugene W. Hickok, Lindy Ritz, Preston Jay Waite, William Winkenwerder, Jr., M.D., and Holly Wise; a forum on "Getting Results;" a management article on "Bridging the Knowledge and Skills Gap;" and research report abstracts. 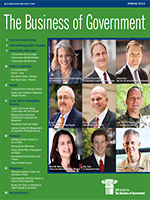 This issue includes the article "Four Trends Transforming Government;" a conversation with Honorable Tom Davis, Chair, House Committee on Government Reform; the management article "Taking Management Seriously: The Deputy Secretaries;" leadership profiles of Angela Antonelli, Dan Gregory Blair, Linda Combs, Cari Dominguez, Jennifer (Jenna) Dorn, Henrietta Holsman Fore, Grant Green, Sherri Heller, and Norm Lorentz; and research report abstracts. 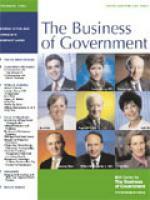 This issue includes conversations with Dr. Francis S. Collins, Director, National Human Genome Research Institute, National Institutes of Health, Mitchell E. Daniels, Jr., Director, Office of Management and Budget, and Charles Rossotti, Commissioner, Internal Revenue Service; articles on Leadership; leadership profiles of Anita J. Bizzotto, Anne H. Chasser, Mark Forman, Major General James T. Jackson, Terence H. Lutes, Gloria R. Parker, Stephen A. Perry, Lynn Scarlett, and David M. Walker; and research report abstracts. 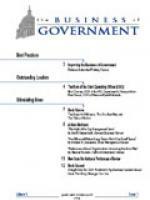 This issue includes a forum titled, "Reflections on September 11th and the Challenge of Homeland Security;" articles on Human Capital; leadership profiles of Karen Cleary Alderman, Mayi Canales, Joseph Cipriano, John M. Dalrymple, Lt. Gen. Michael Hayden, R. Schuyler Lesher, David Mader, Rear Adm. Patrick Stillman, and Angela Styles; and research report abstracts. 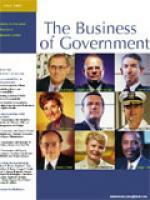 This issue includes articles on "Accountability in Government;" conversations with Mitchell E. Daniels, Jr., Director, Office of Management and Budget, Daniel S. Goldin, Administrator, National Aeronautics and Space Administration, Rudolph W. Giuliani, Mayor, New York City, and Tommy Thompson, Secretary, Department of Health and Human Services; leadership profiles of Dana A. Brown, Stephen T. Colo, William R. Ferris, George C. Fields, Jane F. Garvey, Brigadier General Edward M. Harrington, Nina Rose Hatfield, Stanley R. Sinclair, G. Martin Wagner, and Vice Admiral Thomas R. Wilson; and research report abstracts. 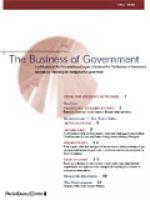 This issue includes articles on "The New Administration;" leadership profiles of Ida L. Castro, Marc Grossman, Deidre A. Lee, John Nolan, Michael T. Smokovich, and Bonnie G. Tischler; and research report abstracts. This issue includes the "2000 Presidential Transition;" leadership profiles of Melissa J. Allen, Gene L. Dodaro, James J. Flyzik, Dr. Thomas L. Garthwaite, Janice R. Lachance, and Jacquelyn L. Williams-Bridgers; and research report abstracts. 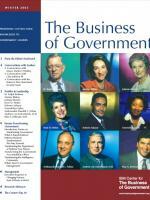 This issue includes an article by Rudolph W. Giuliani on "Restoring Accountability to City Government;" leadership profiles of Thomas R. Bloom, Bradley A. Buckles, Richard D. Calder, Samuel Chambers, Jr., Thomas H. Fox, Raymond Kammer, Brigadier General John J. Kelly, Jr., Raymond W. Kelly, Donald J. LaVoy and Barbara L. Burkhalter, Admiral James M. Loy, John P. Mitchell and Coleen B. Vogel, and Robert E. Wenzel; and research report abstracts. 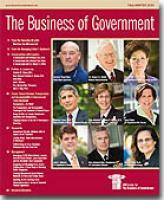 This issue includes a conversation with Secretary Donna Shalala and Deputy Secretary Kevin Thurm; articles "The Chief Financial Officers Act - 10 Years Later" and "Transforming the District of Columbia Department of Motor Vehicles;" and research report abstracts. 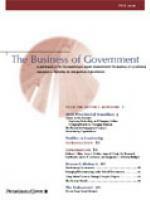 This issue includes the article "Balanced Scorecards at the Veterans Benefits Administration;" conversations with Vice President Al Gore and Senior Policy Advisor Morley Winograd;" articles on Government Reinvention, 6 Years Later; and research report abstracts. 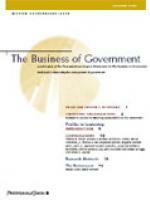 This issue includes conversations with Robert L. Mallett and Deidre A. Lee;" articles "Jumpstart Management: Changing Bureaucracy" and "On the Frontier: Launching Government's First Performance Based Organization;" and research report abstracts. 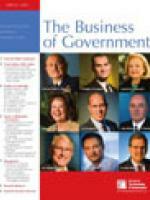 This issue includes conversations with David M. Walker, Comptroller General, U.S. General Accounting Office, Michael Critelli, Chairman and Chief Executive Officer, Pitney Bowes, Inc., and Kenneth W. Kizer, Under Secretary for Health, U.S. Department of Veterans Affairs; and the article "Transforming a Traditional Agency into a Business: The United States Mint." 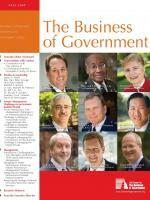 This issue includes conversations with Norman R. Augustine, Chairman, Executive Committee, Lockheed Martin and Stephen D. Potts, Director, Office of Government Ethics; and articles "Transportation Administrative Service Center," "Reflections on the Government Performance and Results Act," "The Pathfinder Principles: Management Lessons from the Mars Pathfinder Mission." 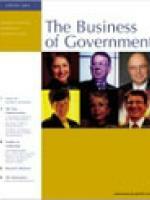 This issue includes the articles "Improving the Business of Government, U.S. Investigations Services," "Public-Private Partnership At Work," "Card-based Purchasing and Effective Government, " and "Public Policy Education: Responding to the Changing Needs of the Public Policy Arena;" conversations with Camille Cates Barnett, Chief Management Officer, District of Columbia and Robert O'Neill, County Executive, Fairfax County, Virginia; and a research report and book abstract. 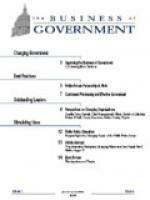 This issue includes the article "Using Technology to Expand Home-Ownership;" conversations with Philip A. Odeen, Executive Vice President and General Manager, TRW Systems & Information Technology Group and James Lee Witt, Director, Federal Emergency Management Agency; and research report and book reviews. 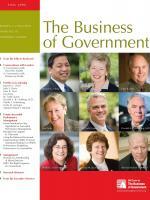 This issue includes the article "Improving the Business of Government: Defense Commissary Agency;" conversations with Dennis W. Bakke, President & CEO of The AES Corporation and Alan G. Merten, President of George Mason University; and research report and book abstracts. 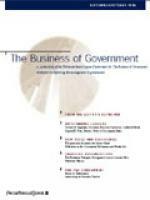 This issue includes the article "Improving the Business of Government: Defense Automated Printing Service;" conversations with Mort Downey, COO of the U.S. Department of Transportation and Paul Daoust, COO of Watson Wyatt Worldwide; and research report and book abstracts.